I know the pain of weeping in my husband’s arms after a baby shower, unsure if my baby would ever wear her new, pink clothes. I have given birth for an audience of more doctors, nurses, residents and fellows than I could count. I have said goodbye to a daughter I just met so she could be delivered to a surgeon…in an attempt to make it whole. A stomach so nervous it feels poisonous. I have felt the hand of a little life grab my finger and hold it…asking silently for me to lead her. I have sat in numb confusion while my baby lived…and the baby on the other side of the curtain didn’t. I have questioned God and His goodness. I have brought a baby home–so vulnerable and trusting–with a pulse-ox machine never far and CPR notes within arm’s reach. I have sanitized people head to toe before letting them enter my home, missed Christmas parties, dinner parties, and birthday parties in fear of the germs in attendance. I have leaned hard on God and He has proven Himself sturdy. I have seen His grace. I have tasted His love. 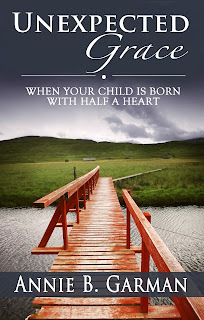 To read the whole story of Annie’s journey as a heart mom or share it with someone you know facing a difficult diagnosis, check out her new book HERE.